This diagram shows the difference between regular and plasmonic gratings in terms of fluorescent intensity. Photo courtesy of Shubhra Gangopadhyay/Nanoscale. COLUMBIA, Mo. – Research completed through a collaboration with University of Missouri engineers, biologists, and chemists could transform how scientists study molecules and cells at sub-microscopic (nanoscale) levels. Shubra Gangopadhyay, an electrical and computer engineer and her team at MU recently published studies outlining a new, relatively inexpensive imaging platform that enables single molecule imaging. This patented method highlights Gangopadhyay’s more than 30 years of nanoscale research that has proven invaluable in biological research and battling diseases. The team’s custom platform uses an interaction between light and the surface of the metal grating to generate surface plasmon resonance (SPR), a rapidly developing imaging technique that enables super-resolution imaging down to 65 nanometers—a resolution normally reserved for electron microscopes. Using HD-DVD and Blu-Ray discs as starting templates, a repeating grating pattern is transferred onto the microscope slides where the specimen will be placed. Since the patterns originate from a widely used technology, the manufacturing process remains relatively inexpensive. 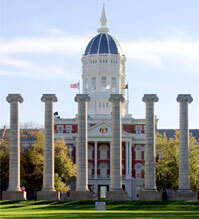 Gangopadhyay’s work also highlights the collaborations that are possible at the Mizzou. Working with the MU Departments of Bioengineering and Biochemistry, the team is helping to develop the next generation of undergraduate and graduate students. Patents and licenses developed by MU technologies help create and enhance relationships with industry, stimulate economic development, and impact the lives of state, national and international citizens. “Plasmonic gratings with nano-protrusions made by glancing angle deposition (GLAD) for single-molecule super-resolution imaging” recently was published in Nanoscale, a journal of the Royal Society of Chemistry. The National Science Foundation provided partial funding for the studies. The content is solely the responsibility of the authors and does not necessarily represent the official views of the funding agency.